The lights are back on at the Abbey! 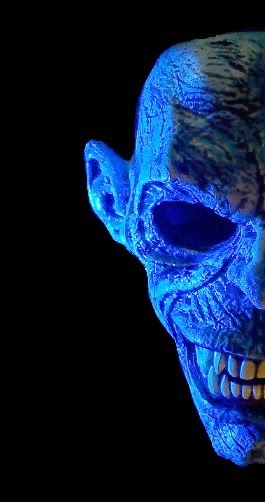 Be sure and take a trip down 125th street to see what’s in store for Halloween night! We are looking forward to seeing you! 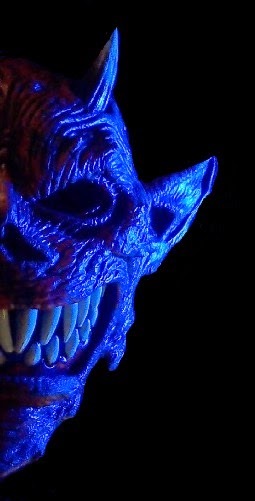 And as always, like us on Facebook to keep up with the creepiness!!! Things are underway for the Halloween 2017 season here at The Abbey! We are going to lay low in the grave this year and scale back on the display a little. BUT we are doing that because we have already begun work on next year, bigger and better!!! We promise 2017 will still be full of frightfully awful things that you won't want to miss! Follow us on FACEBOOK to keep up with all the goriness and check back here often, you don't want to miss out...NO, I MEAN IT: YOU DON'T WANT TO MISS OUT!!!!! Elizabeth Witch here dropping in to say HI!!! I hope you've had a fantastic summer! Everyone here at the Abby is super excited to get the season started. 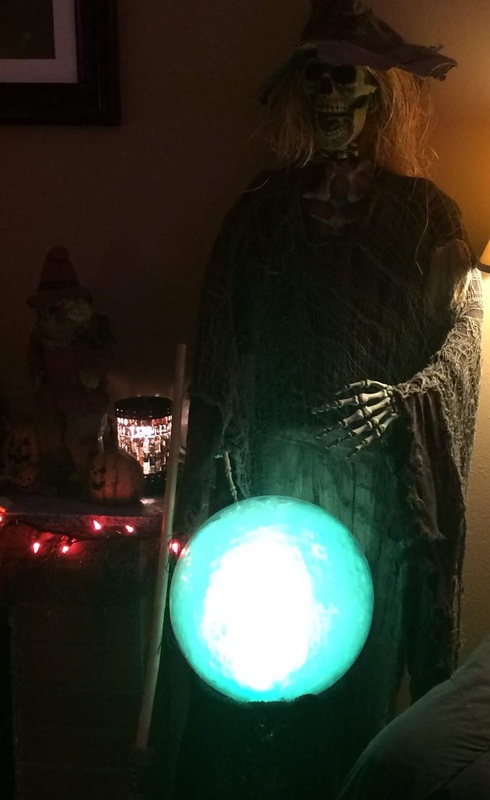 We will start haunting the Facebook from time to time to keep you all up to speed on the spookiness that's going on here in our little town of Pumpkin Hallow, so be sure to check on us often. 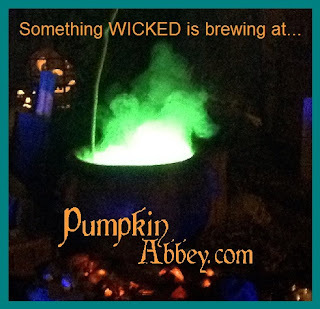 Grimm will be taking pictures, we'll have the annual cauldron lighting, wickedness of all sorts, don't you DARE miss out...until next time...don't drop a house on anyone!!! PS Pictures and video will be posted soon! Hello little evil ones! Just thought I’d update you on the crazy week we’ve had here at The Abbey. Bernard’s accident with the cauldron last week has caused a huge uproar around here. It seems when he fell in the cauldron it made the potion go bad, so he threw it out into the cemetery, which made all the bodies dig their way out all at once. All of the skeletons are dancing around making it impossible to get anything done around here. The grave digger is working as fast as he can to get everyone back in the grave by Halloween, I just hope he can get it done in time. If he doesn’t, Halloween night could be just dreadful for all the little trick-or-treaters, and we wouldn’t want that…or would we??? Alice has been hard at work stirring the kettle and getting ready for the BIG NIGHT! It's just around the corner!!! Hello from Pandora my little wicked ones! The season is in full swing here at The Abbey, I hope everyone is being good little spooks and goblins. Well, OK, don't be too good! 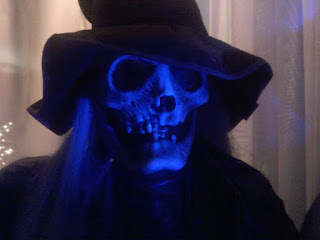 Here is a picture Grimm took of that freaky ol' Bernard, up to his usual high-jinks! 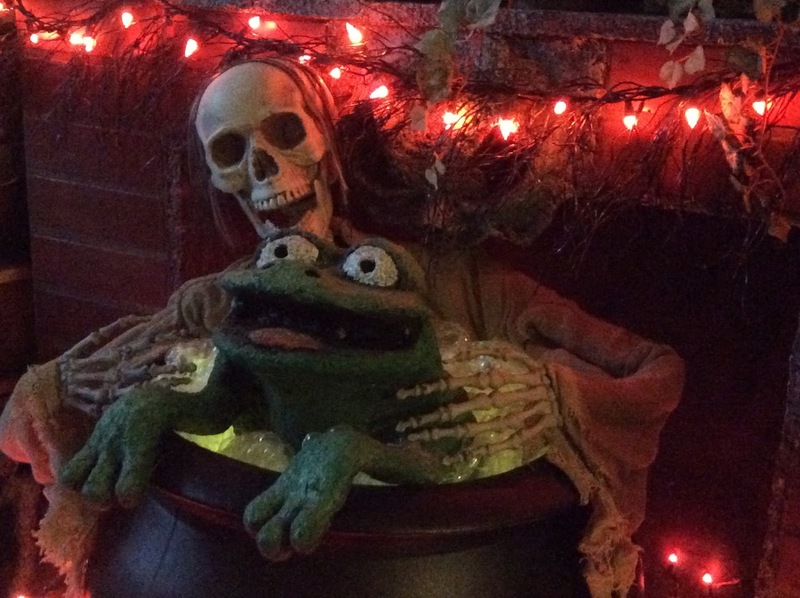 He was doing some kind of crazy experiment on that frog and fell into the cauldron! I should go help get him out. Be sure and stop by Facebook to keep up on the day to day around here (and more pix), we've got all kinds of creepy things planned for this year! Things are stirring! Check out the Facebook page to keep up with all the latest!!! THANK YOU EVERYONE FOR ANOTHER GREAT YEAR!!! Halloween 2014 is in the grave and we had a BLAST! Thank you to everyone who braved the cold and stopped by the Abbey, we have the BEST neighbors EVER!!! We are going to catch our breath for a while and then go to work planning next year. We hope to see everyone again in 2015!!! Until then, we have posted pictures from last night on our Facebook page, just click here. Or you can watch the video here. And be sure and LIKE our Facebook page to stay up to date year round. Early in October this year I got a call from the Count, bringing the wonderful news that he would be attending this year’s Halloween festivities at the Abbey. The news was wonderful because we haven’t seen the Count in many decades. He has been busy, spending most of his time in the southern United States. Apparently there has been some kind of trouble down there involving vampires and fairies and such. But that seems to be over now and he is looking forward to a relaxing Halloween with us and the residents of Pumpkin Hallow. There is one slight problem with this happy little scenario however; he is bringing two friends with him. I use the term friend generously because these two are not very friendly at all. They are two demons that he picked up when he was visiting down in Transylvania. When he got them they were just little imps. He brought them to the Abbey that first Halloween after he got them, which was also the last time he came to the Abbey. There was an awful trouble that night. 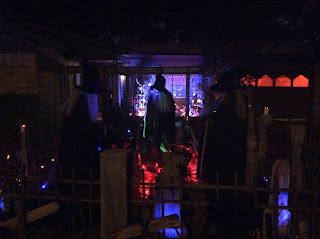 It seems they just didn’t understand that the purpose of the evening was to give out candy to the little trick-or-treaters. They kept chasing the little tikes and trying to steal their candy. Why it was just frightful. I do hope they have learned to behave themselves over the years, but somehow I doubt it. 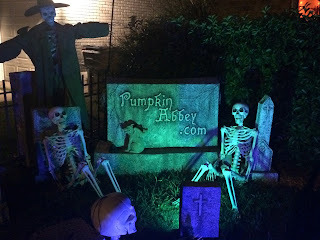 We have been doing so much work here at the Abbey to get ready for this year none of us have had a spare minute to jump online and give you all an update. So tonight I knew I simply had to take the time. We have done some changes to the front of the Abbey and we are all just thrilled about it! 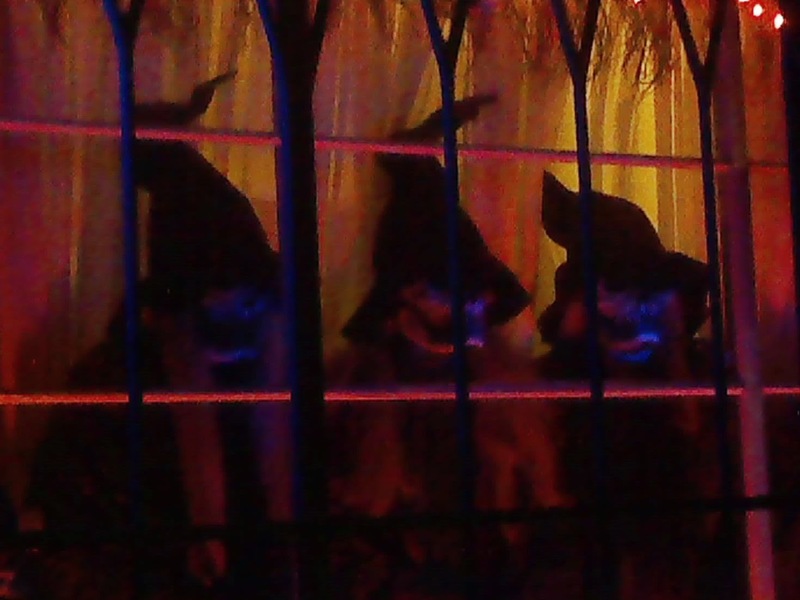 Grimm took some pictures of all the excitement for you (and a little sneak peak of what we have for you this Halloween night! Just click HERE to take a look)! Of course we have been battling those ghosts like you wouldn’t believe, which of course is making things so much more difficult. They just won’t leave us alone. And when we confront them about it they make up some crazy story. But we know they are lying, why we can see right through them!!! And they are always moving things around, making noise, and knocking things over. When we scold them they just claim it was a BOO BOO! 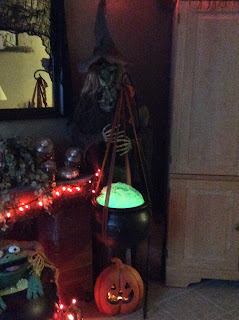 Well, I should go, tomorrow is the full moon which means its cauldron lighting night! And of course that means it’s time to start on all those spells…I will send someone by later this week to let you know how it’s going.